I'm moving upstairs. A couple of years ago I asked our landlords if I could give back the shop part of my premises. Since the popularity of internet shopping has increased my visitors have dwindled. It is a large shop, we are no where near a high street and give free UK postage so unless someone actually wants to spend time with us they may as well save on fuel and have their goods delivered. Most do just that. This morning the landlord's agent popped in to see me. He brought a group of people...and they brought tape measures. Anyway, the result is they want to have my shop but they need me out by next weekend (21st July). Eeeek. I don't have time to do a civilsed winding down sale so I am open to offers on what is there. Stencils and equipment such as paints and brushes will continue to be sold on line so I will just move those upstairs to the office but the furniture, shop fittings, fabrics, gift items, fabrics and anything that I don't have room for will need to go to new homes. We are open from 9-5.30 Mon to Fri. I can be there out of hours by appointment. Contact details are here or leave me a message on this blog. I'll continue to host classes, they will be in the house not the shop. I'll have new dates soon. Everything sold on line will continue as before. Check our blog and Facebook page for any 'specials' that we may decide upon. A long post...but it's worth it. We are having a clearance sale and have listed all bargains below. Recently, Helen has told you that within a couple of weeks we will cease offering UNCUT stencils for sale. Many of you may have benefitted from purchasing an uncut version of a stencil at a cheaper price in the past, then cutting the pieces out yourself using either a heatpen cutting tool or scalpel. This is particularly beneficial when ordering one of our fabulous chinoiserie panels, for example. You still have a couple of weeks so if you want to take advantage and stockpile some uncut stencils, get your order in now. We are offering some spectacular savings on a selection of uncut stencils we have left in stock. These are sold on a first come, first serve basis and there is only one of each. To help you I have made each of the listings into a link through to our site. If you click on a listing below, it should bring up the page on the Stencil Library site so you can look at the design and check the dimensions. As with all our stencils, these are non-returnable for refund or exchange. All prices are in GBP POUNDS STERLING. To check the current exchange rate, click here. When you email your order, we will email confirmation of it's receipt and to advise you that you will receive a paypal request for payment. Scalpel handle and pack of blades. Advance Warning. The end of the uncut stencil. When we started The Stencil Library in 1988 all our stencils were cut by hand. Each order was printed in our basement studio then the individual shapes in the stencil were cut out using a surgical scalpel. Each evening my husband would help me to cut them out. We listened to the television rather than watched it. When friends visited us they got used to talking to the top of our heads because we rarely looked up from our cutting boards until the days orders were fulfilled. We offered our customers the option of uncut printed patterns as an alternative to the ready cut stencil. Their investment in time and skill to cut the stencil was rewarded with a cheaper price. This was a popular offering and in those days a lot more people were willing to spend the time cutting in order to save money. As technology and our bank balance improved we invested in Arnie an Austrian robot that cut our stencils electronically. We still offered the uncut stencils because some people enjoyed the savings and the cutting process. It can be very therapeutic... no really it can. In the next few days Rachel will be clearing the uncut stock remaining in our shop in Stocksfield. She will be offering them on this blog at much reduced prices. Some will cost as little as two pounds and she is doing a special offer on scalpels and electric stencil cutters when bought with an uncut stencil design. There are tips on how to cut a stencil on this blog, there is a photo tutorial in my books Stencil It and The Stencilled Home and on our web sites. You also get instruction on stencil cutting when the design is mailed to you. 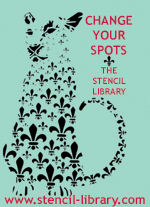 So if you want an uncut stencil pattern visit the site and order soon. To see what we have in the sale check back with this blog in a couple of days. When they're gone... they're gone. The Morris ladies are are having a huge clearance in The Stencil Library shop, our homes... and even our wardrobes. Every so often I'll feature something from the sale that deserves a wider audience than our Stocksfield shop can acheive. Today it's the turn of Rachel's stripy Regency style chair. CO19 small peacock feather stencil. It is narrow, neat and in pretty good condition. Gilded with Dutch metal and upholstered in striped, linen mattress ticking, this chair has appeared in many of our photos and now is looking for a perfect spot in someone else home. Price £65.00. DM3 chevron decorating mask stencil. The shop is open from 9 - 17.30. We close on Sundays and public holidays. Stocksfield Hall. NE43 7TN.